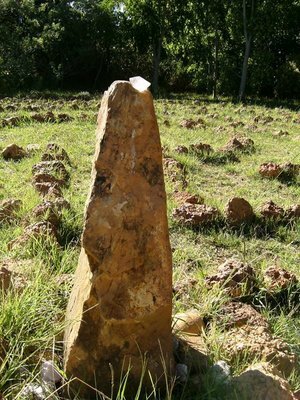 The Santa Rosa design is but one in the lineage of the many labyrinths created over the past three to five thousand years in all parts of the world. It was the first of a wave of neo-medieval designs, created since the mid-nineties in the United States by diverse labyrinthers for different needs and styles. These contemporary designs meld together the seven circuits of the classical labyrinth and the quarter and half turns of the ancient medieval labyrinths. 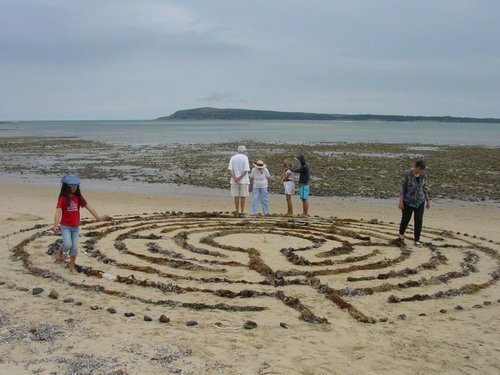 Santa Rosa Labyrinths have now been built throughout the United States and around the world. 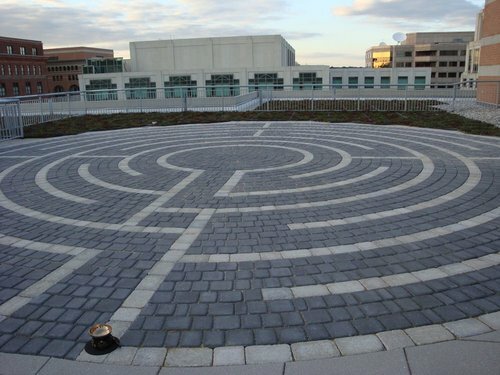 From left to right: The Santa Rosa Labyrinth on the Green Roof of the American Psychological Association, Washington, DC; The Santa Rosa Labyrinth on a bluff in Australia; The Santa Rosa Labyrinth at Standing Bear Park, Ponca City, Oklahoma, installation by Marty & Debi Kermeen of Labyrinths In Stone; Santa Rosa Labyrinth in South Africa. Of all the diverse labyrinths there are two designs from antiquity that are the most recognized: 1) the Classical Labyrinth; 2) the Chartres Labyrinth from Chartres, France. Since the mid-1990’s there has been numerous contemporary designs created that are not found in the historical record. The first to emerge of these new designs was the Santa Rosa Labyrinth, created and copyrighted by Lea Goode-Harris in 1997. This seven-circuit labyrinth has quarter and half turns, as the medieval labyrinths, with the addition of a "heart-space" on the fourth path that is approached from all four directions. The heart-space can be left empty or objects can be placed to help focus the walk on a specific theme; such as a birthday, a celebration, to mark a loss, or to help with focus and creativity. 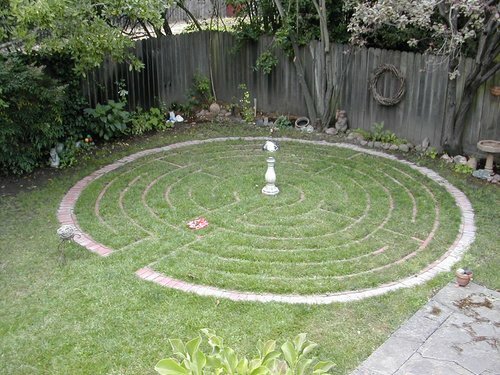 Please contact Creative Labyrinths if you would like for us to assist you in creating your own Santa Rosa Labyrinth as well as any other labyrinth designs.